As your trusted New York Toyota dealership, we are always on our toes and ready to help you with all your automotive needs. 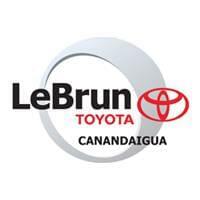 Contact the professionals at LeBrun Toyota in Canandaigua, NY today to receive more information or to schedule a test drive. Don’t forget to browse through our full selection of New Toyota models and all our tested and approved used cars for sale. If you can’t find anything that catches your eye on our lot, let us know. Tell our Personal Auto Shoppers exactly what you’re looking for in a vehicle and we will personally search for the best match. We look forward to working with you!